A Registered Building Surveyor is specifically trained and qualified to carry out House and Apartment Surveys. Perri & Associates Registered Building Surveyors specialise in this area. We will survey your new home until satisfied that everything that can be done to protect your interests has been carried out. We take our business and your interests very seriously. Most of our referrals come from previous clients. Our record speaks for itself. When choosing most services, people will generally be guided by the recommendations of others and by reputation. At Perri & Associates we get approximately 90% of our business through referral from Solicitors, Brokers, and most importantly from Our Customers, and our reputation is second to none. We will inspect your new home until we are satisfied that absolutely everything that can be done to protect your interests has been carried out, whatever the time involved. Our Surveyors ensure that you are getting the time deserving of the massive investment that you are undertaking. After the inspection you will receive a comprehensive professional report in a timely manner, providing you with clear and concise information on the property’s condition and advice on any items or areas that require attention. You will also receive advice on any further measures that we deem should be taken to protect your interests. Substantial advice is normally provided for your solicitor also. Our commitment to you does not end once we have completed your report. We keep all survey records on file indefinitely so that you can call us at any time to help answer any questions that may arise afterward. 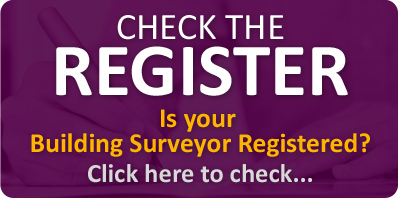 A specialist Registered Building Surveyor has vast experience in carrying out Residential Surveys. We have carried out over 10,000 Surveys since establishment as private practice surveyors in 2002. There are many crossovers in the work carried out by Surveyors, Engineers and Architects, however normally each specialise in certain areas. 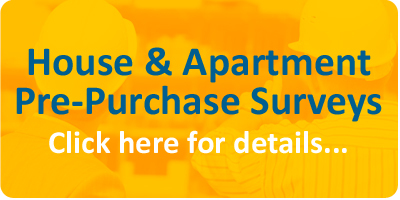 Pre-Purchase Surveys are a core competency of Registered Building Surveyors. That’s why it’s best to choose a Registered Surveyor for this type of work. Building Surveyors also specialise in the relevant related areas, such as Compliance Certification, Land / Boundary Issues and Mapping and have a comprehensive understanding of many other areas that arise as part of a property purchase. We are Chartered Members of the Chartered Institute of Building and the Chartered Association of Building Engineers. We are Building Surveying Members of the Chartered Institute of Building, which has 60,000 members worldwide and over 2,000 Irish Members. The CIOB is the world’s largest professional construction institute and comprises the largest range of disciplines within the construction industry. We are also Chartered Members of the Chartered Association of Building Engineers. As Chartered Environmentalist within the Society for the Environment, we are considered specialists in the field of sustainable construction. Francis is founder of Perri & Associates Building Surveyors. Following completion of his primary degree in 1994, Francis began his career working for large residential developers, reaching the position of general manager of a leading residential building company after a number of years in varying roles. During this time, Francis managed the construction of several thousand residential units. In 2002 he established a professional building surveying practice, which is continuing to expand and has to date surveyed thousands of residential properties. He has built up a solid client base including private clients, architects, solicitors, agents, lending institutions, and mortgage brokers. 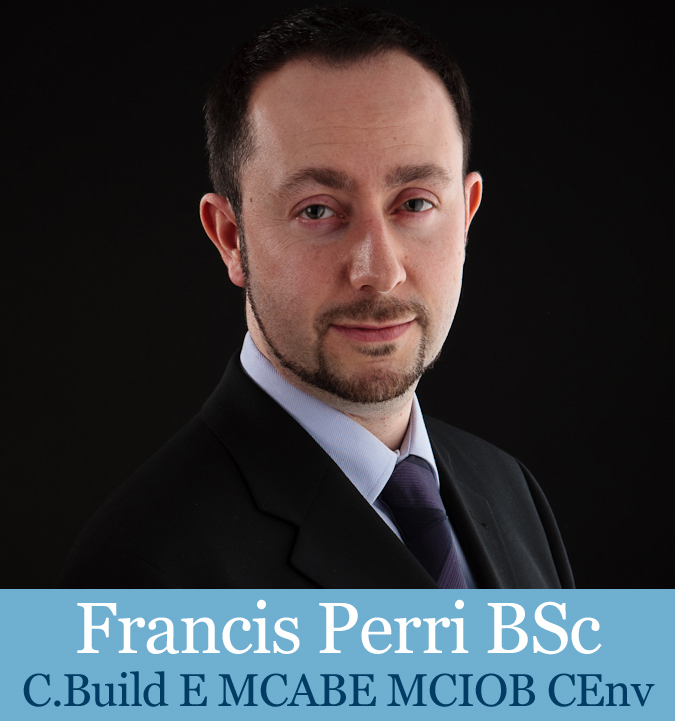 Francis is actively involved in industry matters and the professional institutions, and was previously vice-chair of the Eastern Centre of the Chartered Institute of Building (CIOB) in Ireland. He continues to be actively involved. He has given opinion on industry legislation on an ongoing basis in his capacity within the professional institutions and in private practice.